As your organization transitions to a modern application architecture, it is critical you choose a database that will accelerate the benefits of today’s agile development technologies. Redis Enterprise is that database. Developed by Redis Labs, Redis Enterprise extends the capabilities of open source Redis, the most popular in-memory database, to provide the flexibility, performance, reliability, and return on investment demanded by the world’s largest organizations. 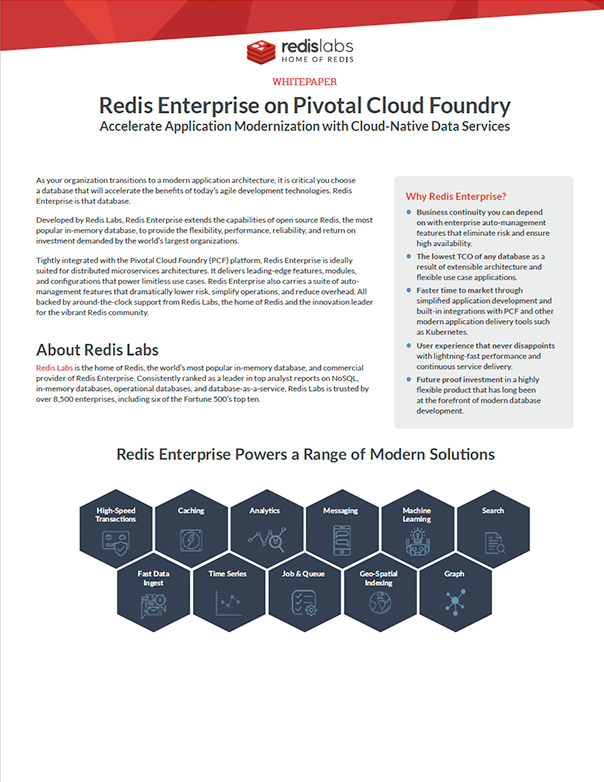 Tightly integrated with the Pivotal Cloud Foundry (PCF) platform, Redis Enterprise is ideally suited for distributed microservices architectures. It delivers leading-edge features, modules, and configurations that power limitless use cases. Redis Enterprise also carries a suite of automanagement features that dramatically lower risk, simplify operations, and reduce overhead. All backed by around-the-clock support from Redis Labs, the home of Redis and the innovation leader for the vibrant Redis community.